As schools say goodbye to traditional computer labs, educators and administrators are quickly learning technology is conquering classrooms and finding its way into every aspect of learning. Everyone from superintendents and curriculum directors to counselors and teachers are throwing around words like routers, G Suite, Smartboards, servers, access points, Chromebooks, virtual reality, and more. Technology is everywhere and where it isn’t, it is typically still wanted by everyone. So how does your tech stack up against other districts around the country? At Kajeet, we wanted to uncover the latest tech trends, specifically related to 1:1. We surveyed 333 K-12 educators and administrators from approximately 300 schools and districts. Think Everyone is 1:1? Think Again. While it may appear students everywhere are getting their own devices, 58 percent of survey respondents stated they have a 1:1 program in at least one grade level. That’s a lot of devices but still far from 100 percent. However, schools and districts continue to focus their efforts on 1:1 implementation, with eight percent of all respondents rolling out 1:1 programs this fall. In addition, another 24 percent of respondents are actively considering it in the future. Overall, that leaves 10 percent who are not yet considering a 1:1 program. It’s hard to believe just a few years ago only 16 percent of schools were 1:1, according to a study by Pearson. And the 1:1 enthusiasm continues for next year. Twenty-six percent of respondents said ‘continuing, improving, or implementing a 1:1 program’ is a top tech priority for the 2017-2018 school year, right after 48 percent who plan on ‘increasing or improving technology.’ If you're implementing a new ed tech program this year, download our free guide to help you get started. With so many device options out there, what are educators turning to? You can see for yourself who the clear winner is: Chromebooks. 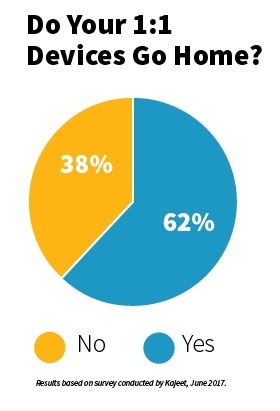 Sixty-three percent of survey respondents report using Chromebooks as part of their 1:1 program. The iPad is the second most popular choice at 40 percent. Respondents could select multiple options, and surprisingly these 1:1 programs often include multiple devices. On average, each 1:1 program incorporated 1.5 different types of devices. And the type of device choice is apparent. 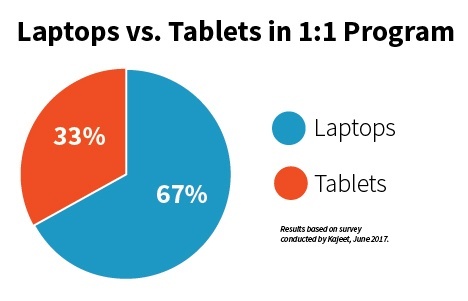 Over two-thirds of all devices currently used by respondents are laptops over tablets. Of the 33 percent who do use tablets, iPads take the lead at 81 percent, leaving little room for other tablets in 1:1 programs. Yes! Sixty-two percent of respondents allow students to take their school-provided devices home whereas 38 percent do not let their devices leave the school premise. With the immense growth of 1:1 programs, the expectation for students to be able to access that same technology—whether it’s online research, their school’s Learning Management System (LMS), or even G Suite—outside the classroom is quickly taking root. But what happens when a student doesn’t have those same resources at home? Allowing students to bring their devices home can extend the learning outside the classroom but can be disparaging if there is no Internet for students to connect to once they leave school grounds. This disparity can lead to the creation of an even larger Homework Gap than what would exist without the 1:1 program. If you want to learn more about the Homework Gap, and how school districts have worked to close it, check out our free eBook here. Of the respondents that have a 1:1 program, less than half (49 percent) said they address students without Internet at home. Of the schools and districts respondents who address the Homework Gap, many attempt to do so in a multitude of ways. At Kajeet, we help schools and districts solve their Homework Gap by providing filtered, Education Broadband™ to their low-incomes students. 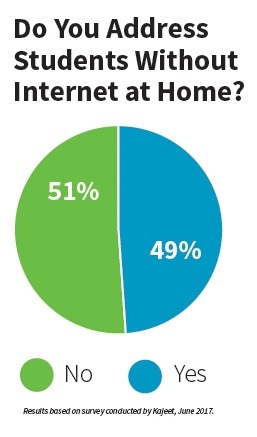 This is particularly important for the 51 percent of respondents who are not addressing Internet access once their students take the devices home. If you’re interested in providing your students Internet outside the classroom, contact us here. What is the 1:1 Holdup for Districts? With the majority of schools and districts already employing 1:1 programs (58 percent) and another 32 percent implementing or considering a program for the future, what’s stopping all students from having a school-issued device? Almost three-quarters of all respondents (74 percent) stated that ‘lack of funds for devices’ was an issue for a 1:1 program from being implemented in their school or district with a ‘lack of funds for software and digital textbooks’ coming in a distant second (32 percent). Technology will continue to permeate the K-12 classroom and both education leaders and teachers will need to adjust and learn from these new experiences. As seen with the survey, 1:1 programs will only increase in quantity, scale, and scope. Have an opinion about this survey? We’d love to hear it. Submit a comment below to start a conversation.